Evanston Township High School, 1600 Dodge Ave. School board officials voted on Monday to pass a resolution that restricts board communication with the public. 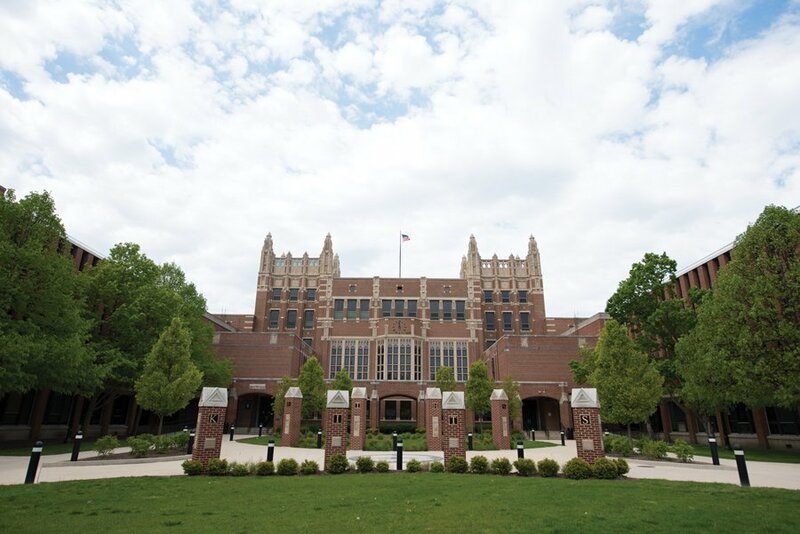 The Evanston Township High School/District 202 school board passed a resolution Monday that restricts the board’s ability to share internal communication with the public, raising concerns among some board members that the limit may be unconstitutional. The board voted 5-2 to approve the resolution, with Jonathan Baum and Gretchen Livingston voting against the proposal. The resolution, effective immediately, states that all written and email communication between board members and the board president or superintendent is confidential. Board members must assume all written communication is confidential unless either the author of an email or document says it can be shared with the public or there are “extraordinary circumstances,” though the resolution does not define what that means. Baum told The Daily, he believes this “gag rule” infringes on his freedom of speech by impeding his right to share information. The resolution, he said, is a “violation” of the public’s right to know what goes on in government. The motion was introduced after some board members felt Baum violated the Code of Conduct by forwarding emails concerning censorship of the school’s newspaper, Baum told The Daily. He said it is “ironic” that the dispute started with a concern about censorship since it shows a similar tendency to control information. Before the resolution passed, the Illinois American Civil Liberties Union expressed interest in looking at a possible legal challenge, Baum told The Daily. ACLU Director of Communications and Public Policy Ed Yohnka said the ACLU is exploring what the resolution means and what it does, and they do not have any definitive actions to take on the matter at this time. Livingston said at the meeting she has embraced the idea of the ACLU examining the issue, though she said it’s “embarrassing” to have gotten to that point. She added that in her nine years of service on the board, she has never encountered a “more dangerous attempt to undermine the public trust.” She said the presumption of confidentiality directly contradicts the Illinois Freedom of Information Act, which states that all public records are presumed to be open with a few exceptions. While FOIA presumes records to be public unless the information falls under certain protections, Livingston said the resolution directly contradicts the spirit of openness in both FOIA and the First Amendment. She told The Daily that sensitive information can still be legally kept confidential without the resolution. Board member Mark Metz said at the meeting that he does not believe the resolution is a danger to the board’s transparency. He said the purpose of the proposal was to reaffirm the Code of Conduct and ensure some “level of confidence” between the superintendent and the board members. Superintendent Eric Witherspoon said at the meeting he spoke with the board’s attorney, who said the resolution does not contradict FOIA. He said it is “perfectly acceptable” for a certain level of expectation of confidentiality, and the motion simply outlines a protocol. The public can still request emails and documents be released through FOIA, he said. Board member Patricia Maunsell said at the meeting while she sees the need to be mindful of transparency, she does not believe this is a transparency issue.